You’re probably thinking this is an Irish family food blog so what the heck has hummus, a Middle Eastern dish have to do with Irish food? I believe that our food experiences define our tastes and flavours as a family. My father served with UNIFIL (United Nations Interim Force in Lebanon) more than once as I was growing up. On one of his tours of duty my family was lucky enough to spend a number of months living across the border in Israel while he commuted to Lebanon for work everyday. I am still in awe of my mother who packed up the house, put it up for rent while we were away, and took 4 children on her own to Israel to meet him. I celebrated my 12th Birthday while we were there and I have very vivid memories of the time we spent in the Middle East. We did get to visit Naquora in South Lebanon many times and the food and meze that we experienced there lives strong in my food memories. The bright orange of carrots cut into batons served with pink peanuts, a sprinkle of sea salt and a squeeze of lemon, crunchy white cabbage served in the same way, soft chewy lebanese flatbread still warm from the oven and of course every table included hummus and tabouleh. You would tear off a smaller piece of this gigantic flatbread which was bigger than my youngest sister (2 at the time) and use it to scoop up dollops of fragrant hummus while the breeze came in off the sea and the scent of meat grilling in the kitchen got your taste buds screaming for more. I could talk and write of our stay for hours on end and I will revisit it and my food memories again. In the meantime here is a simple recipe for hummus that is best prepared 4/5 hours before eating to let the flavours develop. Items like lemon, garlic, pepper & salt you add or remove from the recipe to taste. Personally I like my hummus bursting with fresh lemon juice flavour. If you haven’t come across tahini before it is ground sesame seed paste and easily found in jars most ethnic food stores. I serve hummus with toasted pita breads, crunchy carrot sticks, and if I’m very bold, crisps. It’s also delicious in a sandwich or wrap as dressing for grilled meat with a leafy salad. In the picture here it has a small bit of paprika sprinkled on top to give your taste buds a zing if you’re lucky enough to scoop up some. Put the chickpeas, tahini, garlic & lemon juice into the food processor and blend until it has the consistency you like. I like mine a bit chunky but smooth is fine too. 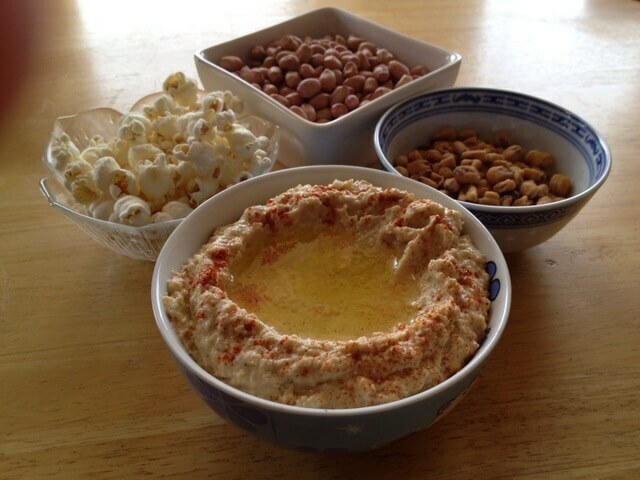 If your mixture is a little too stiff or claggy and you intend to eat it the same day you are making the hummus then add 2-3 tablespoons of water to loosen the mixture. If you would like to keep the hummus overnight then add 2-3 tablespoons of olive oil then pulse the hummus until it is well mixed. Store in a well sealed container in the fridge for up to 3 days if you have added olive oil by pouring a further 2 tablespoons of olive oil on top of the hummus which keeps it fresh, if not eat within 8 hours of preparing.